Already! 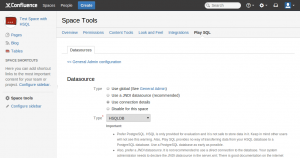 I’ve released the version of my SQL plugin for Confluence 5.0. It has a new index page for tables. It gives immediate view of all tables in the current schema and the URL used to connect. For each table, you can see the number of rows. To display the page quickly, only the first 5 sizes are displayed and the cache will save the value. When you click on the tables, the first 20 rows are displayed and you can modify the query using the SQL panel. I’ve made a nice present to Confluence 4.3 users: This version of Play SQL is still compatible with Confluence 4.3. I have removed support for Confluence 4.2, because no customer has declared using that version. Are you disappointed? If you use my software and rely on its features, it is important to share your experience with me, and I will care for you when I release a new version. Please share your experience with me, in private or in public. I need to build a contact book of my core fanboys to consult you when the plugin evolves. Also, subscribe to this blog by email using the field on the right sidebar. Nice work mate – really love seeing our 5.0 ideas being thought about carefully by developers. The table link in the space sidebar makes sense as long as a DS is connected for that space. Nice. The colourful icon is a little distracting though. Our new design guidelines generally call for grey-scale icons unless absolutely necessary (so as to face into the background when in chrome). Maybe worthwhile moving to a colourless version to fit in better w/ ADG? Also – just wanted to say Hi! Lots of guys in the Confluence Dev team are cheering you on from this end. Great work. If you’re ever in need of ideas, they’d love to help / talk / share. Are you Mike, like “Mike”, as in “Mike Cannon-Brookes” !? I’m impressed that I’ve been discovered already and that you take the time to review all plugins of Atlassian Marketplace yourself! Thank you for your advice, I’ll make good note of it.